Sigh, let’s see. Where do we start? HAHAHA so funny~~~… sorry. Anyway, onto the actual spoilers. The scene is more shocking in book form since it has an entire page to its own, and the text on the page before that is perfectly spaced to lead into the next page. The line immediately leads to the next chapter “Fragment: Natsuki Rem”. The translation for the web novel version can be found under “IF: Natuski Rem”. The really messed up part is that in this timeline, Rem grows into Emilia’s hairstyle. However, immediately after this, the group is attacked by an unknown force. The group is rapidly killed/knocked out, the carriages get destroyed, and finally, Crusch attacks the man with her sword with her “Blessing of the Wind” (invisible strike). The sword strike had cut through the thick skin of the white whale, and fell its enormous body at a large sacrifice compared to those of manabeasts, there was no way that the man’s body could resist this strike. The man tilted his head, and the brushed off the sword strike that connected with his body. Later on, Crusch’s right arm is blown-off as she tries to fight back. The actual metaphor here, is “I wish that his heart will ripple” (like water). Subaru and Ferris return, and reunite with Rem and Crusch, and discover that Crusch has lost her memories, and that everyone has lost their memories of Rem. While Crusch is still conscious, Rem is in a coma. Subaru and Wilhelm have a conversation. Wilhelm thanks Subaru once again, and it is revealed that a wound had been inflicted on Wilhelm’s left arm when it reopens. However, Wilhelm tells Subaru that it is an old wound, inflicted by his wife who had the ‘Blessing of the Death God’, which deepens one’s wounds when they are around the person who inflicted it, and reopens old wounds. Then, between parts 3 and 4, Subaru commits suicide by stabbing himself in the throat with a dagger, however, he ‘returns by death’ only to find himself at Rem’s bedside, confirming that his save-point had been updated. As Subaru contemplates, Emilia enters the room looking for Subaru. They talk about Rem, and Emilia believes what Subaru says. When Subaru states that Rem is Ram’s little sister, a brief comic relief of ‘Besides the chest size, everything else is fairly the same from Ram.’ ensues (though isn’t dialogue). For the one who declared it, this was a declaration of war against destiny. if it’s not satella then maybe it’s echidna. Now, off to showing this to my friends and have them mindfucked. The scariest part is Rem with long hair. Why? Rem’s long hair occurs in an alternate timeline where Subaru gives up on saving Emilia and runs away with Rem. 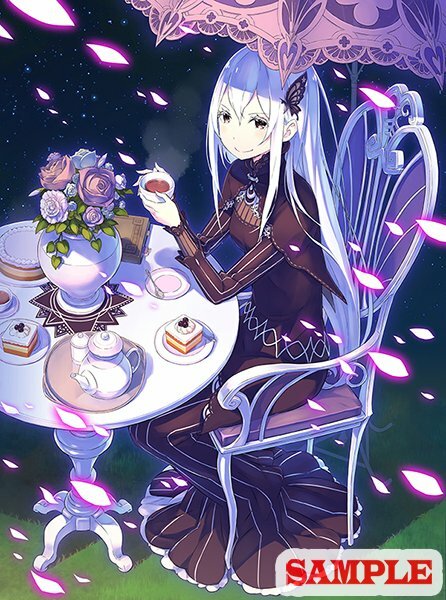 However, you can see that Rem’s long hair is reminiscent (if not exactly the same) as Emilia’s hair. The metaphor here is that regardless of Subaru’s decision in that timeline, and despite Subaru’s sincerity, Rem is just a replacement for Emilia. Thats why she do all the possible things to anchor Subaru, do his favotire food everyday, more children ( ͡° ͜ʖ ͡°)…even leave her hair like Emilia when Subaru just suggested to leave her hair grow. I prefer happy endings… so I’ll bet on the fact that the world haven’t been covered in frozen land… which meant Puck haven’t took action because Emilia is still alive due to some other factor thanks to the lack of Subaru’s involvement. Conclusion: Subaru’s disappearance from the stage actually fixed everything. Here are some minor spoilers, but in the timeline where Subaru dies to Puck, Reinhart kills Puck to stop his rampage. ….. True. No objections to that. Happy ending went through the drain! Pingback: Translation Diary – KonoSuba Volume 10 Redrawn Cover, Re:Zero Volume 9 (After Anime) Spoilers, and more!